Who Has the Best Oktoberfest Beers? In this crazy world of craft beer and hundreds of styles ranging from Pilsners to Russian imperials, I have people ask me all the time, “What’s your favorite beer?” I don’t have an answer to that. I can, however, answer with my favorite style of beer and that’s the Oktoberfest. All year long, I wait in anxious anticipation for fall because that means the Marzens are coming back. I enjoy a good fresh hop and a good pumpkin beer, but give me a good festbier any time. 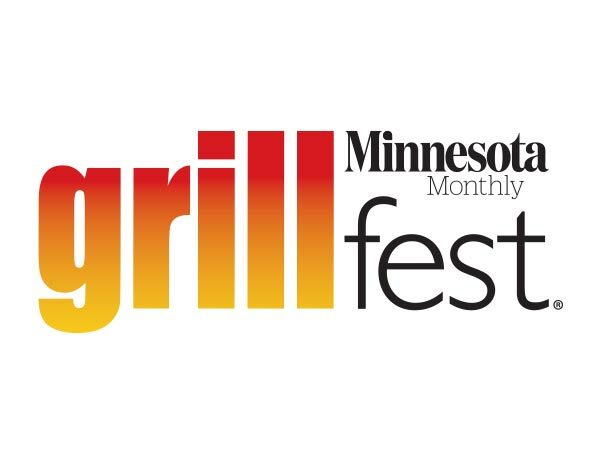 This year, I decided to figure out who’s got the best fest. 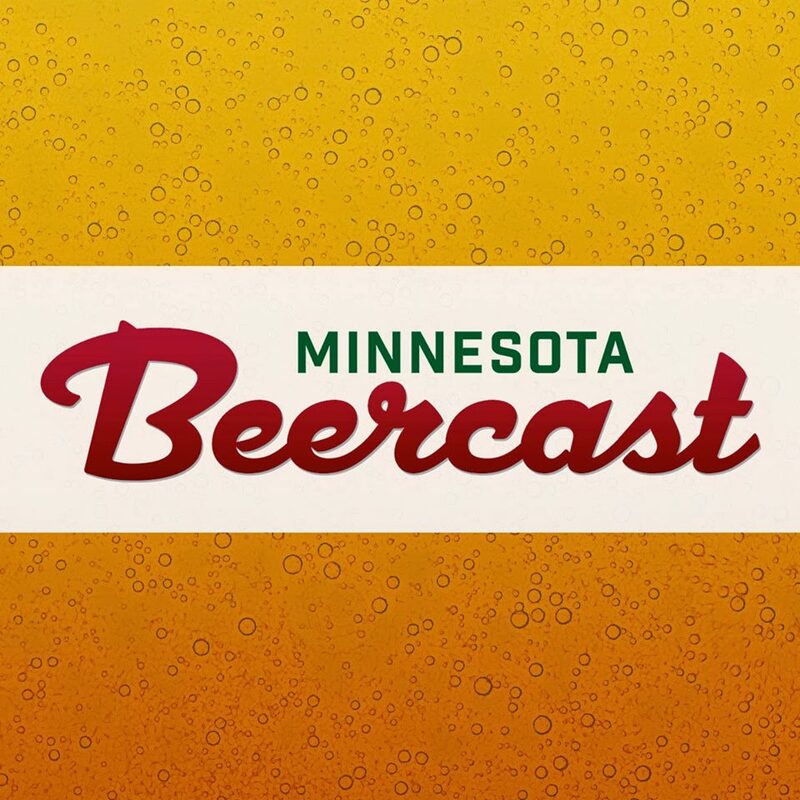 Myself, along with a panel of craft beer fans all with great palates made our way through 30 Oktoberfest-style beers over a 3-week period to get to the bottom of it. Oktoberfest and its relation to beer is really just a coincidence. The history of the style came from regulations set forth in Germany in the year 1516 which did not allow brewers to make beer during the summer months when they were more prone to infection and mishandling. This was also the law that forced the use of hops for bittering and preserving the beer. March was the latest in the brewing season, so brewers made sure to have their supply full as the opportunity came to a close. These March (Marzen) beers were lagers that would be ready to drink at the end of summer. In October 1810, Crown Prince Ludwig of Bavaria celebrated his wedding by throwing a party for the town centered around a horse race and held festivals every year after to celebrate his matrimony. The townsfolk also had barrels full of Marzen beer which they needed to drink up because the brewing season opened back up in the fall, so they brought all their remaining beer to these festivals to have the people help empty their supply. Thus, Oktoberfest was born. With the anniversary of the reunification of Germany happening in early October, the dates shift yearly to help the festival coincide as closely as possible with that date as well. Today there are 6 breweries that are officially allowed to use the term “Oktoberfest” in Munich. All other brewers use the title “Fest Bier” to denote the difference. In the US, there is no such law, so we use Oktoberfest for all our Marzens. There is a huge difference between the German Oktoberfest producers and the American ones. 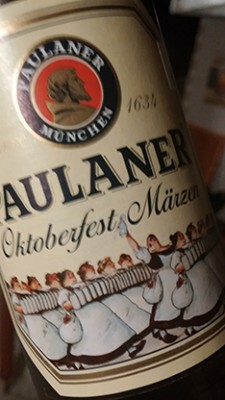 Until scientists linked hard water to brewing techniques and figured out ways to adapt the pH in local water, dear old Munchen was not very good at making pale beers. Traditionally Munich beers are darker and maltier, so the traditional Oktoberfest as it was historically is an Amber-brown lager much like we know in the United States today. In the late 20th century, Munich brewers began to make a paler, crisper beer, possibly as a result of the heat at the festival being too much to drink a heavier, sugary beer. In America, our beers remain darker. We have covered a number of beers of each of these styles and will judge them side-by-side without paying any sort of bias to one style or another. Before I get into the beer themselves, I want to thank everyone for reading this and encourage you all to continue supporting our craft breweries. I also need to thank Elevated Beer Wine and Spirits, Four Firkins and Ale Jail who all provided most of the beers for this sampling. We have evaluated these beers based on their craftsmanship, balance, complexity and desire to order another. Points are deducted, however for excessive deviation from the Marzen style. Each of our scores has been averaged together to create one score for each brewery overall. Okay, let’s find out who’s got the best beers! I have to say that I was very excited to crack this bottle. It comes in a gigantic resealable bottle that now sits proudly in my bottle collection. The beer was good, but that’s about all. This is on the lighter end of the German-style Marzen beers. Lots of grassy malt flavors fill the aroma and body of this beer. Flavors of lightly-toasted honey and biscuit build toward the back end and finishes with an herbal hoppiness and a hint of toasted bread. This would be a good beer to have quite a few of at the Munich Oktoberfest, but ultimately leaves us wanting a bit more complexity. The Longfellow neighborhood brewery historically has put out a very good Oktoberfest and this year is no different. Harriet’s ended up being one of the favorites. This is much more in the American-style of Marzen that builds into a richer body than the Altenmunster. The nose gives you an insight into the old-world hops with a spicy, light herbal nose with hints of ripe stone fruit. Hops present themselves right at the beginning with a pleasant spice, while a water-cracker-like malt lays down a base sweetness. The grain-bill then builds complexity by addind flavors of raisin bread and finishes with a touch of caramel that lingers and reminds you that you want another. 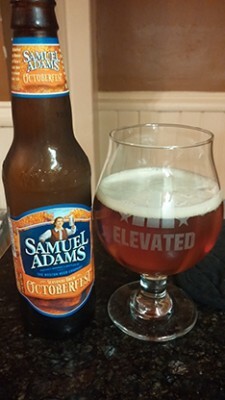 Sam Adams is one of the beers that helps define the American/Original Oktoberfest-style beer. Not surprisingly, the Boston brewery had a very strong showing this year as well. The nose is a little light, but gives you hints of the medium-toasted malt sweetness that is soon to come. The flavor begins at bitter and herbal hops, much like Harriet’s lager. A light graham cracker malt flavor quickly builds to brown sugar and bread-crust flavors and finishes with a hint of caramel before clearing out nicely. The minty, herbal hops maintain their presence throughout the experience to provide a nice balance. Overall, a very good beer. Weiheistephaner is the world’s oldest continually-operated brewery, so these guys know what they’re doing. Their product definitely reflects that and exemplifies true craftsmanship and understanding of brewing techniques. We were initially pretty surprised at the color – a very light gold reminiscent of a pilsner beer, but don’t let that fool you. The nose suggests a pilsner-style beer as well with aromas of fresh-cut grass and sweet young honey. Upon first sip, however, you realize that there is a great deal of malt complexity hiding beneath the surface. The first taste is of a floury undercooked biscuit and takes off from there giving you the flavors of a well-toasted biscuit with honey and a little bit of butter and then finishes with toasted bread crust. Truly a remarkable beer. You must have one. Rich honey and hints of light fruit with an overtone of fresh cut green wood. Rich honey, brown sugar. May be oxidized. Slightly papery and drying. Give this another tasting. Ahh, Hofbrau. The only green bottle in the bunch. Hofbrau-Munchen is one of the 6 official brewers for the Bavarian Oktoberfest style, so this is 100% authentic German-style Oktoberfest beer. That being said, the word pilsner came up quite a bit in our conversation and it’s difficult to associate with being a fall beer. The aroma is of light grass and honey with hints of black currant and wet hay. The first taste is of a doughy, light biscuit complimented by a rich, ripe honey sweetness. Noble hops add an herbal finish. Overall a good beer, but I don’t know that I could look forward to this all year compared to other lagers. Left hand provided us with a good beer this year, but the flavor started to break from style boundaries and ended up losing points overall. The aroma is fruit forward as if to suggest a Belgian yeast temperature during fermentation. There’s a lot of banana on the nose with hints of bubble gum. These esters translate directly onto the palate after first taste and are met by a malt sweetness reminiscent of raisin, fresh bread, and brown sugar. The darker fruits stay on your palate after the malt has subsided, which really pushes boundaries even for an American-style lager. If I were to blind-taste this Marzen, I would probably pick it out as a Biere de Garde. It’s a very enjoyable beer, but not what we’re looking for. These are the droids you’re looking for! The Ayinger lager gives us a perfect nose of rich bread and honey with hints of a golden raisin sweetness. The flavor is also that of a rich amber-gold honey with low levels of diacetyl that lend themselves nicely to the malt complexity. The grains develop flavors of graham cracker and brown sugar while the hops provide just enough bitterness to balance this beer throughout. Overall this was one of the favorites. While in New Orleans, I quickly realized that Abita Amber is the Summit EPA of New Orleans. 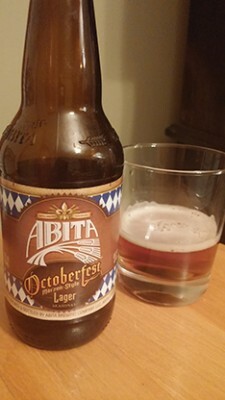 I had many an Amber while eating fresh seafood and listening to live jazz music while in the Big Easy and I looked forward to seeing if their Oktoberfest lager measured up to their flagship. I was not disappointed. The nose brought forth whiffs of light dough and bitter orange peel with hints of bread crust. The base malt was one of fresh bread and well-cooked bread crust reminiscent of a good Bavarian pretzel. The subtle malt complexity leaves you wanting a little more of the complimentary flavors. This is a very well-balanced beer, but perhaps a bit too subtle in the end. Overall, a really good beer. Central Waters is known for being experts at malt-forward beers, but we were let down by this example. The aroma is one closer to a Euro Oktoberfest than an American one with light grassy pilsner malt notes. The body is pretty light overall with sweetness of graham cracker and brown sugar. The mouthfeel is watery and sugary with a few green flavors yet in the brew. This reminds me a lot of tasting wort before it’s fully fermented and left us wondering if this beer needed just a bit more time to ferment before bottling. Summit’s Oktoberfest this year was solid. The lager had a biscuit and toasty aroma with hints of light fruit and herbs. The flavor begins with a grassy light malt balanced nicely by herbal hops and quickly develops flavors of graham cracker and brown sugar. The beer clears up nicely with no lingering hops and a touch of caramel. I should note that there is a nice raisin-like fruitiness throughout that compliments the beer nicely. This was one of my personal favorites and had a good response from the panel. Hacker-Pschorr made two beers this year – a darker malted American/Original style called Original and a modern-Euro style called Authentic. The original was damn good. The aroma is one of a good malt sweetness with hints of white grapes. The flavor itself is one of fresh bread, amber honey and brown sugar. The white grape from the nose carries through into the flavor as well, but is fairly subtle and compliments the malt well. This is a bit lighter than the American/Original styles and has a great flavor, but we felt as if it needed a bit more complexity to receive a higher score. Great beer overall, though. 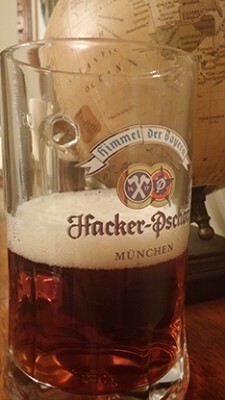 The Hacker-Pschorr Authentic did not have as good a reception as the original. The aroma is one of young honey and fresh cut grass, which translates into a pilsner malt flavor. A slightly minty hop compliments the light body. This is a good representation of the German-style lager, but we felt that it fell a little flat overall and couldn’t give it a higher score. The Prost Oktoberfest was good…but weird. The aromas on the nose were of a toasted bread crust. The body was relatively light for an American style with malty sweetness reminiscent of biscuit, brown sugar and caramel. The problem was that there is a big minty, menthol taste that lingered for quite a while after the finish. While I enjoyed the beer, the cooling menthol taste and sensation was a bit hard to overlook and I didn’t finish the beer. Great Lakes was the first Oktoberfest I had this season over at Butcher and the Boar. The aroma is almost non-existent with hints of black currant bud. The hops take center stage upon first sip while presenting bright, herbal flavors and then quickly clearing out to make way for the grains. The malt is decently complex with notes of doughy, fresh bread, biscuit, and toast. This is overall well balanced, but the hops could have stayed around a little longer to balance the sweetness. The Brooklyn Marzen left a lot to be desired. The aroma brought forth a slew of fruit such as lemon, white grape and red apple. The flavor was more of a flash in the pan, providing notes of dry grass and caramel before disappearing. The first taste is big, but leaves no complexity and a musty cider aftertaste. I didn’t finish my 3oz sample. Goose Island makes some good beers. That being said, this isn’t one of them. An array of fruity yeast esters take over the beer including banana, bubble gum, red grape, plum, raisin, dry peach, and fig. There is a bit of toffee sweetness, but barely any malt presence to balance the fruit salad. Not an Oktoberfest and not a balanced beer. The Big Eddy was disappointing. The flavor lied somewhere in no-man’s-land between a Belgian Tripel and a Belgian Dubbel. The flavor was not great and did not fit the bill for a lager, much less a Marzen. Not really worth investigating. The Two Brothers’ Atom Smasher was also a surprise this year. This lager was a great example of a nicely-balanced brew. It is also barrel-aged, but we did not feel as if that affected the flavor enough to break style guidelines or made an uneven playing field for the others. Rich Amber-Gold honey and fresh-cut grass greet you in the aroma. The rich malt body starts with flavors of toasted biscuits and grow to bread crust and brown sugar sweetness. Oaky vanillin flavor peeks through at the end, which definitely plays well with brown sugar notes. You should pick one of these up. The Lakefront Marzen fell much more on the side of the German Oktoberfest style than the American/Original style. The aroma brought forth images of fresh fall grass clippings from a light base malt. The grassy sweetness continues in the flavor and is complemented with a sweet graham cracker note. Hops balance this beer throughout and the finish is expectedly clean. We picked up the MKE Hoptoberfest knowing full well that it would not meet style guidelines. The beer provides little aroma, despite big flavor. The taste is that of light biscuit and doughy malt notes supplemented with both German and American hop characteristics. It’s a decent beer, but since it’s hop-forward, we can’t judge apples and oranges in the same mix. I’m a big fan or Schell’s Firebrick Amber and was really looking forward to their submission to the Oktoberfest selection, but ended up a little disappointed by the historic New Ulm brewery. The nose is that of light, young apple and the flavor brings forth bready, biscuit and caramel sweetness but the flavor is too light and tastes watered-down. There is a good balance almost no complexity to it at all. I think a simple modification to the Firebrick recipe would have made for a much better showing. 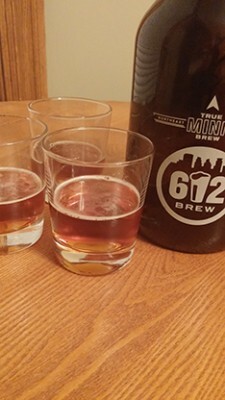 Firstly, I have to thank Robert from 612 Brew for making last-minute accommodations for me to come pick up this beer and include it in our tasting. It’s rare for a new brewery to get into lagers so quickly, much less ones of this quality. 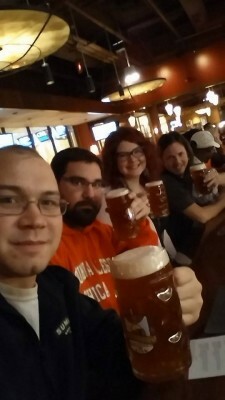 We were really impressed by the 612 Oktoberfest. This is one that we would consider a hybrid between American and German style marzens with a lighter body, but still darker malt notes than modern German producers. The aroma provides a rich nuttiness and notes of baked bread with some stone fruit in the mix. The rich bread and toast translates into the flavor as well and are complimented with notes of caramel and brown sugar. The noble hops subside at the end and leave room for a lingering sweetness that reels you back in for another taste. Beer discussions become interesting when there is one person whose opinions stand out as being different from the rest. Upon further investigation into this obvious Minority Report analogy, we discovered that my beer was very different than the other three that were poured just a few minutes before. While theirs were malty, full bodied lagers, mine remained watery and undesirable. They were poured off the same taps, so we’re guessing I got one near the end of the keg. That being said, a good beer should be consistent throughout and I cannot overlook this error. The bad beer is reflected in my score and has been averaged with theirs based on the correct beer flavor. The part that stuck out about this beer the most was the crisp finish. That was definitely a highlight. The aroma was non-existent, and flavor was well-rounded and malt balanced. There was definitely a good bready sweetness as a base and a hint of caraway that certainly peaked our interest. Though it was a good beer, there really wasn’t a great complexity to it. Again, the highlight was certainly on proper lagering techniques that brought a good, crisp finish, but a happy ending isn’t much without an interesting story (Twilight!). Go have one of these beers, but be ready to send it back if you think it’s too watery. Blue Plate’s Brew Pub is not only a good tongue twister, it’s a damn good brewery. The Freehouse Oktoberfest is exactly what to look for as far as an archetypal American-style Marzen. The aroma was full with notes of caramel and nutty, toasty bread. The flavor had a rich complexity with malty flavors of toffee, peanuts, and caramel. There is a nice hop balance, but definitely not too strong. The lager had a pleasant, full mouthfeel and lingering graham cracker and brown sugar sweetness at the finish. The dark sweetness also had complementary notes of a ripe white peach and pear fruit esters. Definitely one of the best. Sean is a Certified Cicerone® and restaurant consultant with the Better Beer Society. He has an expansive knowledge of beer styles, history, and pairings and advocates for support of local craft brewers. Follow Sean on twitter: @TCBeerDude for no reason at all!